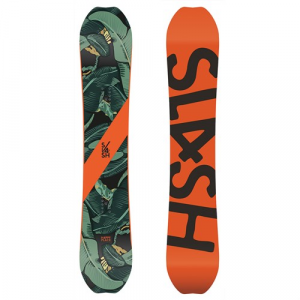 The 2016 Slash Snowboards by Gigi Happy Place snowboard is in one word, playful. If you have ever seen any of Gigi Rüf’s riding you know that he throws down in the backcountry. So the Happy Place is a snowboard designed for when he wants to play in the park. We found it to be at home on the boxes and rails, but it still had the stiffness to do any jumps we threw at it. It’s catch free when you need it to be and still holds an edge for turning. It has UTB (Ultimate Traction Bump) in the side cut, which is a single traction bump in the middle of the snowboard. The CAMROCK design is very playful. The narrow contact points and the lifted tips make the board easy to turn. Added flat spots outside the bindings toward the tip and tail which give you all the pop you need to ollie over anything that lies in your path. The camber between your feet gives you stability and responsiveness in all conditions and terrain types.